Pregnancy can you get too much calcium? Calcium helps your growing baby develop strong bones and teeth but this mineral is also important for heart function, as well as healthy muscles, nerves and blood. 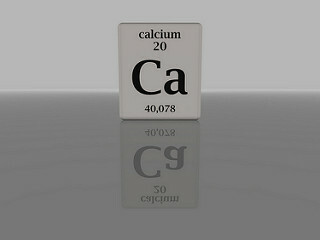 Calcium is, in other words, essential during pregnancy. Is it possible to get too much of a good thing, though? How much calcium during pregnancy? As with many other vitamins and minerals, lots of people in the west have low levels of calcium, and often an actual deficiency. Women who are aged 18 and over will need 1,000 mg a day of calcium, while those who are under 18 require 1,300 mg. The easiest way to consume this amount of calcium is, of course, taking a supplement. But dairy products and calcium-rich vegetables are a better source of this essential mineral. Spinach, sesame seeds and almonds are good sources of calcium, while sardines and salmon are good for omega 3 fatty acids as well! Can you take too much? For some reason, it's pretty common knowledge that taking too much vitamin C in supplement form is dangerous, because of the ingredients added to the supplements. But did you know that it is indeed possible to overdose on other vitamins and minerals, including calcium? If you are taking a prenatal supplement or a calcium-specific supplement, take note of the dose. Calcium supplements come as calcium citrate and calcium carbonate. The latter is more popular and a lot cheaper, but is also harder to absorb. Calcium carbonate does have a little bonus as an antacid, it will help you fight that horrible pregnancy heartburn that turns up during the second and third trimesters for so many ladies. Once you reach 2,500 mg a day of calcium, you're overdosing and entering dangerous territory. If you feel you could be at risk, read the nutritional labels on your food and add your calcium intake up. Of course, veg doesn't come with nutritional information, but that stuff is easily found on the web. When worrying about overdosing on calcium, it does help to remember that you need the right vitamin D levels for calcium to be absorbed probably. If you are deficient (which again, is very common in norther-hemisphere countries), getting too much calcium is a very hard job. What happens if you overdose on calcium? In the unlikely event that you do overdose on calcium (and if you do, it definitely involves supplements), what kind of symptoms can you expect? Well, if you do it only once, you will probably get away with a headache, some nausea and vomiting, and constipation. Hypercalcemia, excessive levels of calcium in the blood, may lead to heart arrhythmia, kidney problems, and calcification of weird parts of your body (not bones). A regular prenatal blood test will pick up on high levels of calcium, but you should also be watching out so that it will never get to that point. Sources of calcium in soy milk?